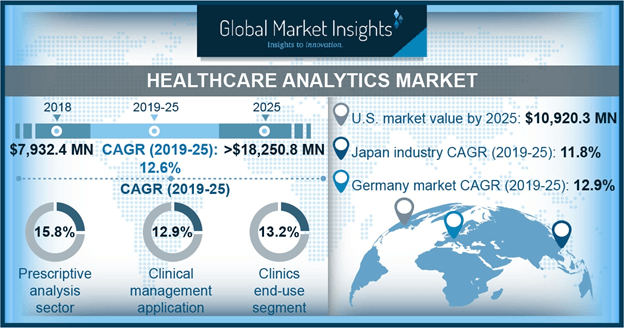 Healthcare Analytics Market size is set to exceed USD 18,250.8 billion by 2025; according to a new research report by Global Market Insights. Providing precise healthcare solutions within budget is the prime objective of healthcare facilities around the world, resulting to increasing use of electronic health records and various analytical software. Increasing use of social media and technological advancements in analytics are major facilitators in achieving this objective. Germany market will expand with a significant CAGR of 12.9% during the forecast period. Penchant to use of advanced technologies and need to limit the healthcare cost should drive the France and UK healthcare analytics market. Increasing implementation of EHR will set the base of healthcare analytics in emerging economies of Europe in coming years.